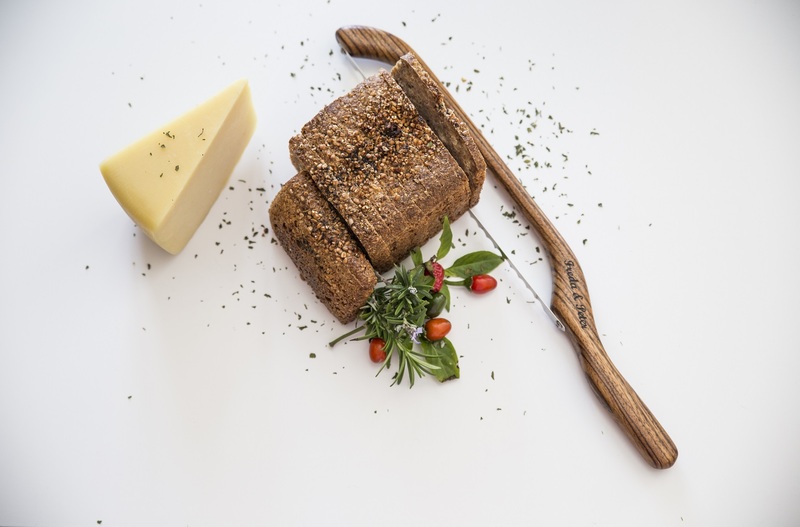 The JonoKnife is a bread saw that uses an extra thin Sheffield made blade to slice bread from very crusty to super soft better than any conventional bread knife on the market. Hard bread. Soft bread. Crusty bread. Bread straight from the oven. Buns, bagels, paninis. Fruit, veg and cheese. Handcrafted on a small farm in the English countryside, the JonoKnife is based on the hundreds of years old bow saw or fiddle bow knife design from the Appalachian Mountains in America. The Sheffield made scalloped blade is about 6X thinner than a conventional bread knife blade. It therefore slices soft and fresh breads with hardly any pressure and will cut hard crusty bread like a sourdough easier than what you could imagine! It’s available in a variety of woods and comes in left and right handed versions. Thanks and we really do enjoy our knife so much. Neat thin slices of fresh bread…… toasted they are extremely tastier and we eat less bread! And the same amount of butter and marmalade! Win win. I bought a JonoKnife last month and I am so pleased to say that my son, who had coordination and motor skills issues as he has dyspraxia can now cut a bagel, a slice of bread and a slice of cake! We are both thrilled. I purchased a knife when you were doing a fair in Salisbury a few weeks ago – my friends LOVE it! I bought one of your knives on Saturday in Swindon and I have a queue of people wanting one! It’s is a brilliant design and has proved itself on some challenging sourdough already this evening. I love the design, especially when a regular house hold problem is solved by clear application! I purchased one of your knives at the Good Food Show at Hampton Court last weekend and it is fantastic! I did have a touch of scepticism when I bought it but that was quickly dispelled when I started using it to slice my homemade bread. No more mis-shapen slices and best of all much less wastage, as now, my husband and I cut it at the same angle. Buy a JonoKnife and get slicing!